The Low-Down: What, Exactly, Is That Autonomous Robot Doing In My Supermarket? What, Exactly, Is That Autonomous Robot Doing In My Supermarket? A robotic brain-in-a-box grants autonomous functionality to otherwise dumb industrial and commercial machines. A variety of cleaner models enable their formerly semi-autonomous floor scrubbers to drive themselves. Automation also delivers items within stores. The system works like an autonomous harbor tug. Human associates load up a trailer with goods and products, then program the AutoDelivery's route and let it do its thing. We often frame new automation technology as a grave and immediate threat to the jobs and livelihoods of the humans whose tasks the machines take over. Tell that to the custodians at Sea-Tac airport who no longer have to spend their nights scrubbing floors, or sales associates at your local supermarket who will no longer have to schlep carts full of products throughout the store thanks to BrainCorps' smart scrubbers and tugs. BrainCorp is an AI software developer based in San Diego, California. Founded in 2009, the company spent half a decade developing its computer vision and automation technology before pivoting into the floor care industry. This service sector "hadn't seen a lot of automation yet or at least successful automation of the products," John Black, Brain Corp's Senior Vice President of New Product Development, told Engadget. "The floor cleaning equipment was very mature and already sort of semi-autonomous in operation, but didn't have full autonomy." And that's where BrainOS came in. The BrainOS is essentially a robotic, well, brain-in-a-box that grants autonomous functionality to otherwise dumb industrial and commercial machines. A variety of cleaner models made by Tennant, Minuteman, Intelligent Cleaning Equipment, and SoftBank Robotics have already leveraged the OS and BrainCorp's Autonomy Kit, which is comprised of off-the-shelf sensors and hardware, to enable their formerly semi-autonomous floor scrubbers to drive themselves. "We call ourselves the software robotics company," Black continued. "In that, the industry expertise for this equipment exists in the current manufacturers. So we were really applying our technology to those machines, and enabling the OEM partners to automate their equipment." These machines only need to be taught their routes once before being set about their task, though their human handlers do have to sweep and dust the floor before the machines start scrubbing. You don't even have to manually supervise them. The scrubbers continuously transmit status information into a cloud-based reporting system that will automatically alert a human via text if the machine runs into an issue that it cannot solve itself. 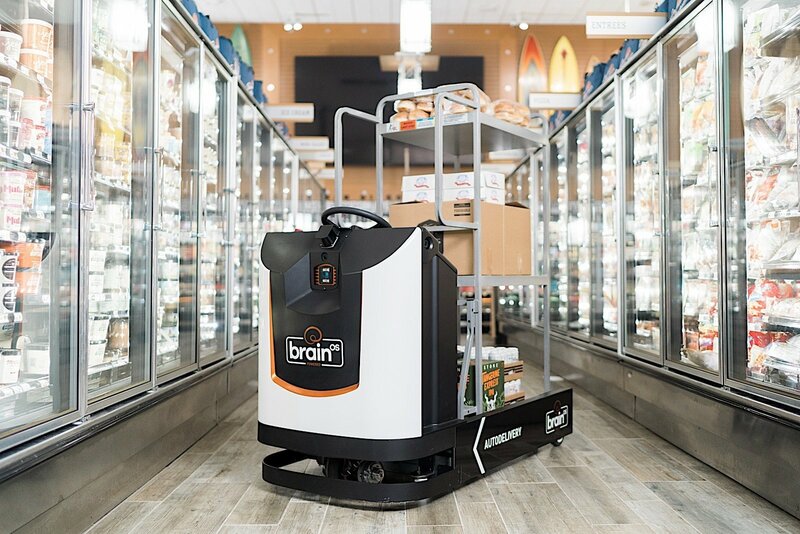 In December 2018, BrainCorp and Walmart agreed to a pilot program that would put its AI-powered clean machines in 360 stores across the US by the end of this past January. The program has already proven such a success that the two companies announced earlier this week that they have agreed to extend their partnership. BrainCorp will supply another 1,500 machines to US Walmart locations by the end of the year, freeing up Walmart associates for less mundane tasks than scrubbing floors. BrainCorp is also leveraging its automation packages to help deliver items within stores and facilities thanks to its recently announced AutoDelivery platform. As you can see in the video above, the system works like an autonomous harbor tug. Human associates load up a trailer with goods and products, then program the AutoDelivery's route and let it do its thing -- like an industrial-sized Big Trak. The AD, like the scrubbers before it, will automatically avoid obstacles, stop in its tracks should a person step into its path and stay there until the interloper moves. "Artificial intelligence enables the machine to know where it is in space and recognize change," Phil Duffy, VP of innovation at BrainCorp, told Chain Store Age in February. "If a person or a box is in the way, it will move around if there is enough space. If the aisle is blocked, the machine will determine how to deal with the situation. It will cut the aisle out of the route if necessary." Not only will human associates have more time to pursue more important tasks, they're also saved the wear and tear on their bodies from pushing heavy carts of products from the storage room to the sales rack. "It's really enabling this upscaling of the [human] operators," Black explained to Engadget. "You're really providing operators a better tool -- the robot as a tool." BrainCorp isn't the only player in this space, mind you. A number of organizations are working to find new applications for their autonomous solutions. MIT, for example, revealed its robotic trash-sorting system that supplements computer vision with tactile feedback. Flippy from Miso Robotics has been cooking burgers in a Bay Area restaurant since 2017, Starship Robotics and FedEx alike are working to take the drudgery out of parcel delivery. 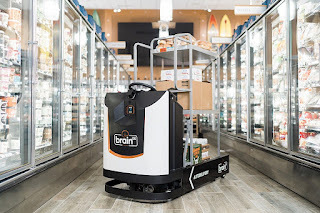 Heck, the BrainCorp floor scrubbers could soon be working alongside Walmart's shelf-scanning robots while the AutoDelivery may one day have to avoid Marty, BrainCorp's mobile monitoring robot, during its daily duties. You can see BrainCorp's floor scrubbers in action the next time you're flying through Seattle-Tacoma airport on a red eye. The AutoDelivery tugs won't be entering service until next year, however they did just make their public debut at the ProMat Show 2019 in Chicago earlier this week.